My husband specializes in lunch. From Ossington to Greenwood, Eglinton to the Lakeshore, Don knows where to find the tastiest midday morsels this city has to offer. It could be pizza, tiropita, falafel or sushi. 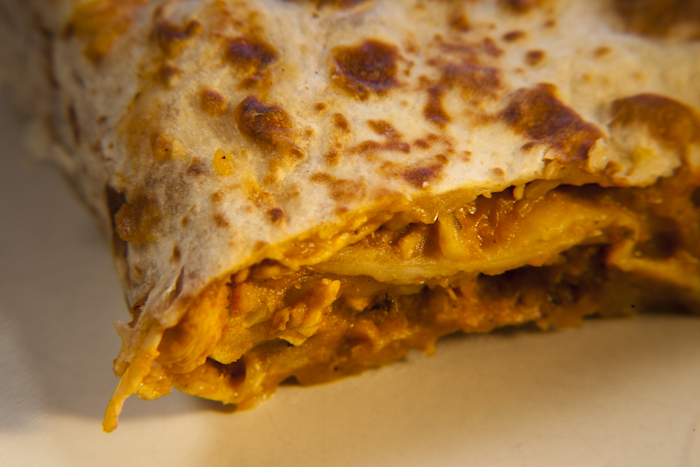 Today it is a butter chicken roti and a vegetable samosa at Gandhi Indian Cuisine (554 Queen St. W; 416-504-8155). Despite his head-shaking declaration: “Not a pretty place, Mado!” I’m eager to see Gandhi’s dark, dingy hole-in-the-wallness for myself. Of course, no one frequents this dive for the ambience and if they must, there are five Formica topped tables near the grease-smudged storefront window. The big business here is takeout. 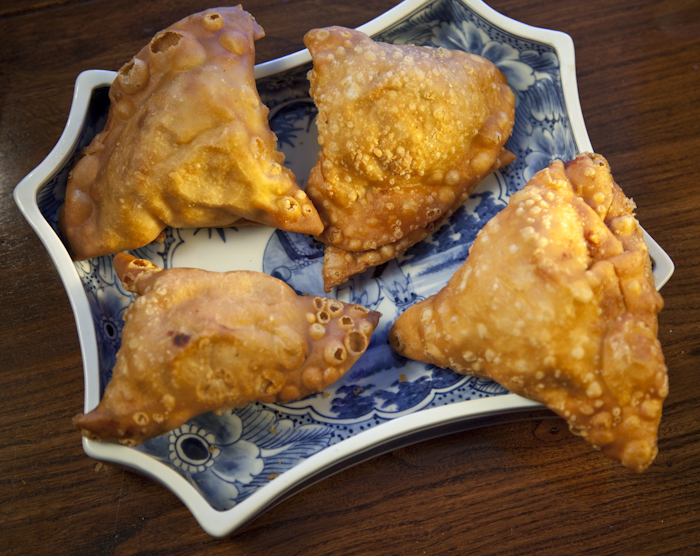 Regulars go straight to the counter mounted over a glass case stuffed high with vegetable samosas and pakoras. Look up, and a weathered bust of Gandhi meets the eye. Someone’s glasses (also grease-smudged) are comically balanced on his nose as he watches over the four cooks working furiously in the cramped open kitchen below him. Many chefs today adore attention, but not the scowling roti roller who keeps looking over his shoulder and sending irritated glances my way. Our order takes only five minutes to prepare and throughout my eyes remain fixed on him. I watch as he takes a saucer-shaped piece of freshly risen dough, slips it between two long, spinning rollers that spit it back wider and thinner, the size of a medium pizza crust. The dough tumbles from the rollers on to a conveyor belt then is scooped up by his quick, nimble hands and guided back into the rollers. 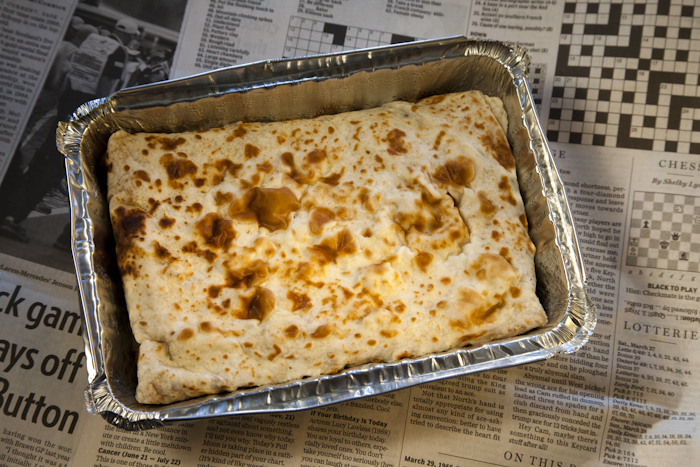 Out comes a voluminous sheet of paper-thin dough with a circumference as vast as a hoola-hoop. The Gandhi grill must be massive enough to accommodate these gargantuan flatbreads that are griddle cooked, anointed with curry, then folded into a precise and perfect rectangle that fits neatly inside a takeout box. At first, $12.95 seems excessive for a butter chicken roti, but hey, it weighs more than two pounds and provides an ample lunch for three! The chicken is moist and shares a creamy, rich red sauce with chunks of potato. The spicing is an intricate equation of coriander, cumin, turmeric and cardamom and as requested, it’s spicy hot. Each mouthful is offset by the grilled, toasty flavours of the wheat roti wrapper. The $1.60 samosa is also gigantic: as big as my hand. Its wrapper is surprisingly un-greasy and flaky, the interior bulging with a traditional potato and green pea filling, redolent with ground and fresh coriander. A small tub of piquant tamarind chutney completes the equation. I’ll go back, that’s for sure. And like many of the regulars, might just call first to place my order. Gandhi plugs itself as “Toronto’s Best Roti” but until I’ve sampled every one of their ten different vegetarian rotis (priced from $6.95 -$10.95) and eight non-vegetarian rotis ($8.95- $12.95), I’ll reserve judgment and dream about the tasty work that lies ahead. This entry was posted in Photos by Donald Nausbaum, Restaurant reviews, Toronto food finds. Bookmark the permalink. My mouth is watering! Love the description of the rolling of the dough. Keep the revues coming. Drooling! What is it with these fab cheap roti joints? We “dined” at Alberts last week and even Bennett could not finish the chicken curry roti he had. Now that is remarkble. How does this place stack up against Jamaican roti at The Real Jerk? Don’t know. Haven’t been to the RJ for over a decade. But I do know that a Jamaican curry will taste different than the Indian one which is served at Ghandi. Jamaican curries don’t usually pack as many spices as an Indian one. Hi Madeline, Great blog (and post!) Don told me I had to subscribe. I am now salivating for a greasy samosa. Thanks for this recommendation. I’ll put it on my cheapie eats in T.O. Hey Nat, thanks for subscribing. Love the one battery moniker! Is your food blog back up? If so, let us know where it is and watch out for those samosas, they are big, bold and fat-laden!